*All of our motorized watercraft come equipped with the latest electronics including GPS with Navionics Hotmaps, presenting the angler with a detailed view of the lake's bottom, aiding with navigation and locating fish holding structure with ease. We take pride in the fleet of boats we own, as safety, functionality and comfort are of our utmost concern. 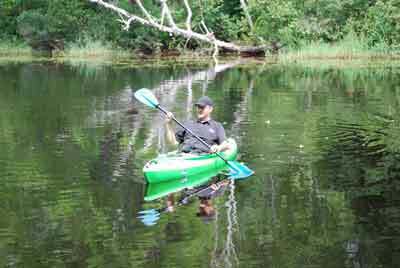 Our rental boats are strong and extremely fishable, but best of all, they are up to date. All of our motors are clean, quiet, fuel efficient four stroke engines, equipped with electric start for your convenience! 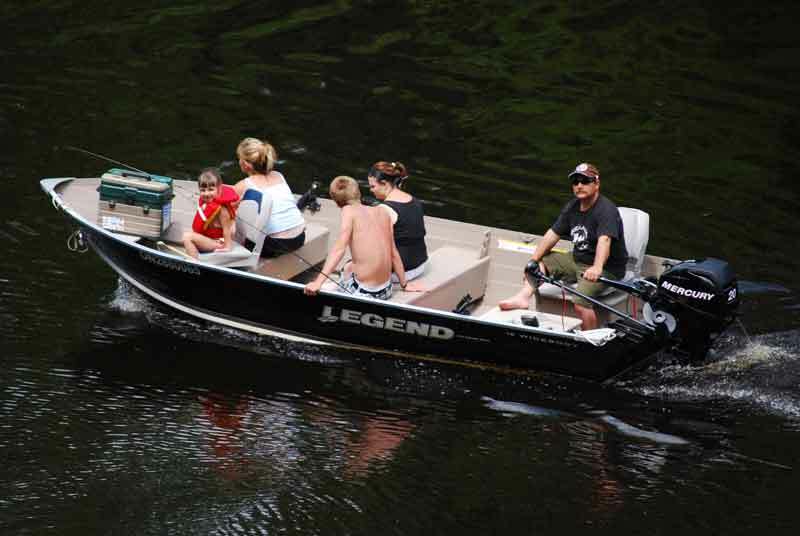 We have 16-foot Legend Widebody boats, complete with swivel seats, fish finder, rod holders and live well powered by 20 and 25hp Mercury four-stroke outboards. Electric motors are also available for rent. As an added bonus, our rental rates on this offering include the cost of fuel. New for 2019. 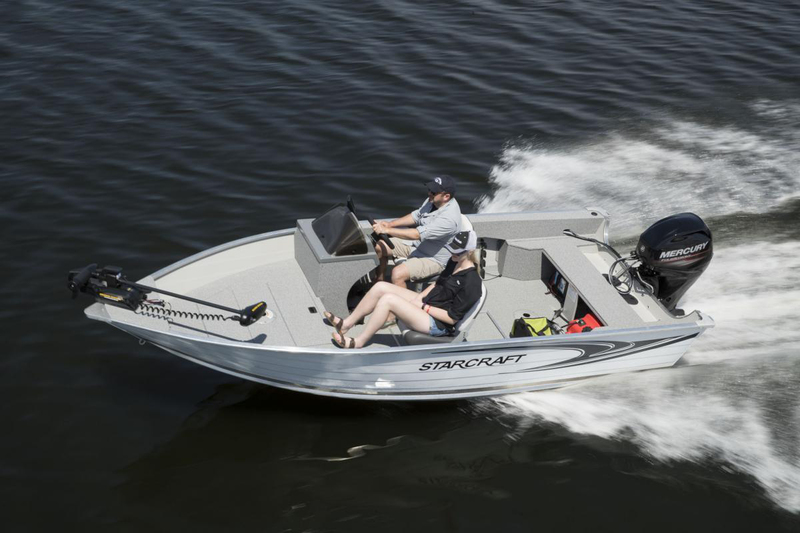 If its a fishing machine that you are looking for, we also offer a 16-foot Starcraft side console bass boat, complete with swivel seats, 2 fish finders, and live well powered by 40hp Suzuki four-stroke outboards. This boat comes equipped with a bow mount electric motor. Our rental rates on this offering include the cost of the first tank of fuel only. Of course, all life jackets and necessary safety equipment are provided. For those new to the boating scene, training sessions are available. 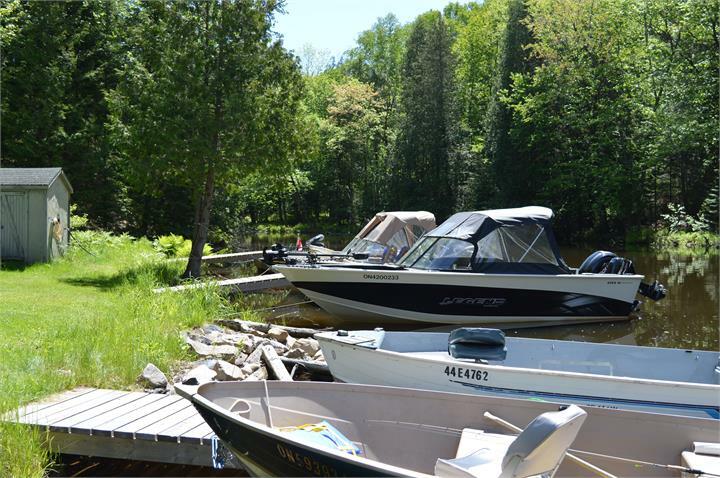 Although we recommend having a boater's operator card, you do not need one to rent one of our boats. Select "Rates" above for daily and weekly pricing. 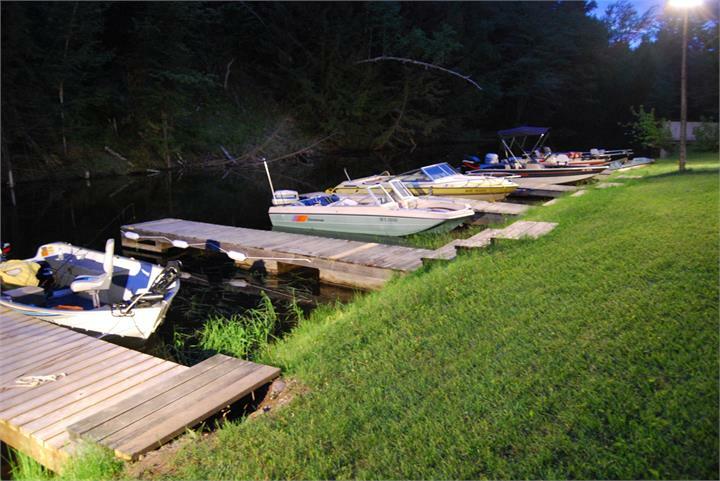 If you prefer to bring your own boat, launching can be done from the township public ramp at the end of our road. 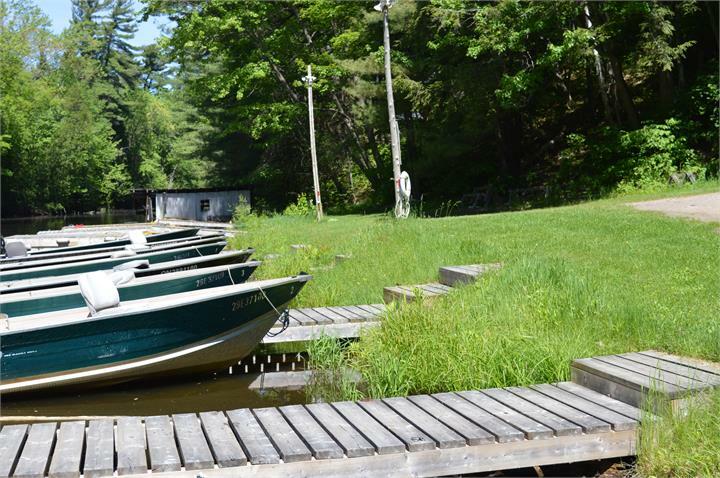 Our docking facilities on Beatty Creek are sheltered from wind, waves and boat traffic and are well lit with shore power. We are able to accommodate all but the largest of vessels. 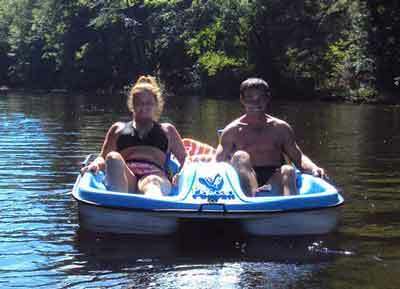 We also offer the use of our fleet of non-motorized watercraft to our guests free of charge. 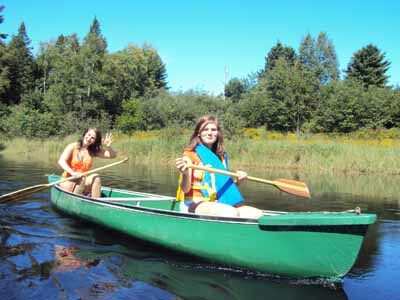 We have canoes, kayaks or peddleboats available. 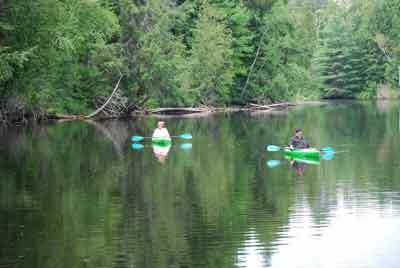 Go for a leisurely paddle on the lower river or for the more adventurous, explore the less travelled section above Chapman's Chute. 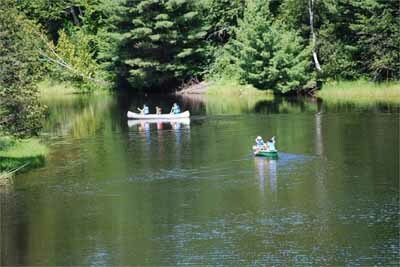 There are miles of waterways to explore! 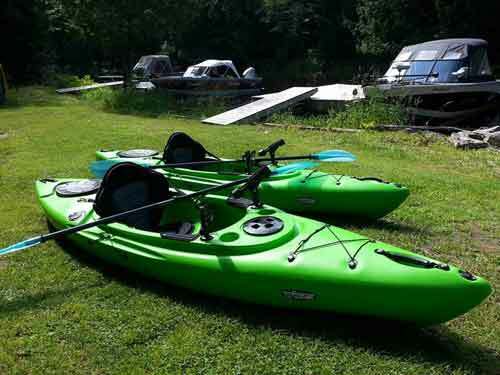 New this season, for a small fee, guests may reserve one of our new fishing kayaks for a day's fishing. We encourage our guests to try this increasingly popular sport. These are strong, stable, specialized craft that offer the angler the ability to fish where other boats just can't. Take one up above Chapman's Chute where you will find miles of river loaded with unpressured fish that other fishermen just aren't able to get to!